Day five, Sunday, the last day… where did the week go? 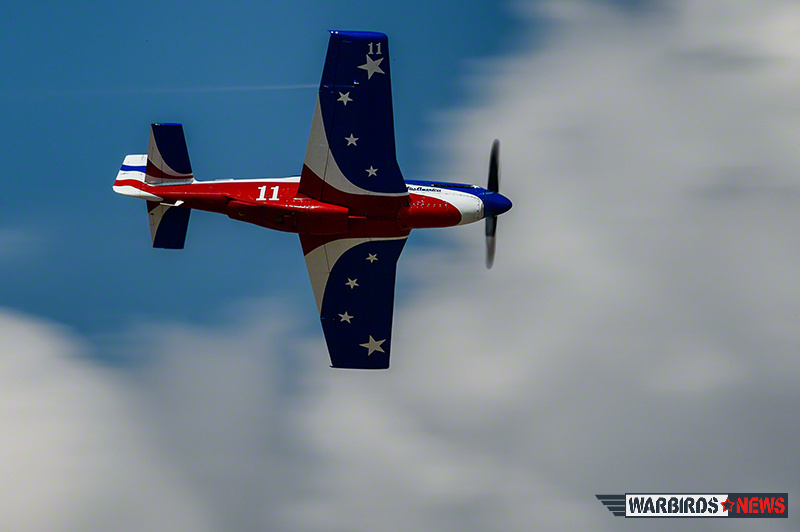 The 50th Annual Reno Air Races has been without a doubt one of the best ones I’ve ever gone to! Cutting right to the chase, the big event, Steven Hinton in Voodoo took first in the Gold Unlimited race making him a five-time champion. But this was the last race of the day, there’s much more to cover before we get to that moment. John D’Alessandris’ #15 P-51D Mustang in the dawn’s early light, day five of the Reno Air Races. 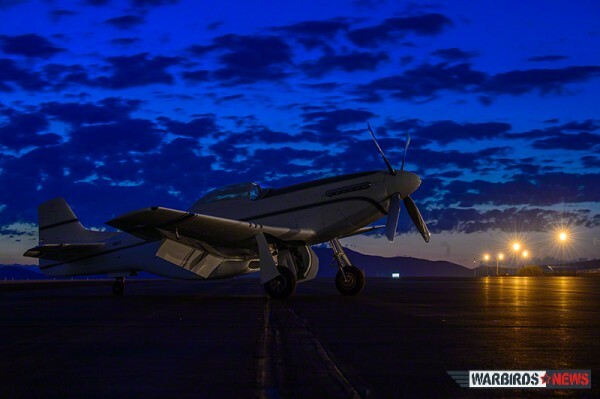 The days at Reno start early, long before the sun comes up, but on this Sunday with so many great planes racing, the place was hopping well before the crack of dawn. The pits are lit up and hangars aglow as teams work on their planes adjusting every spec to maximize the speed they can out of them. The damage to 232 from the previous day was now dashing their hopes of making it to the Gold Race today. The Voodoo and Strega teams were doing last minute minor adjustments and the Czech Mate crew simply talked with the crowd and polished their incredibly solid performer. 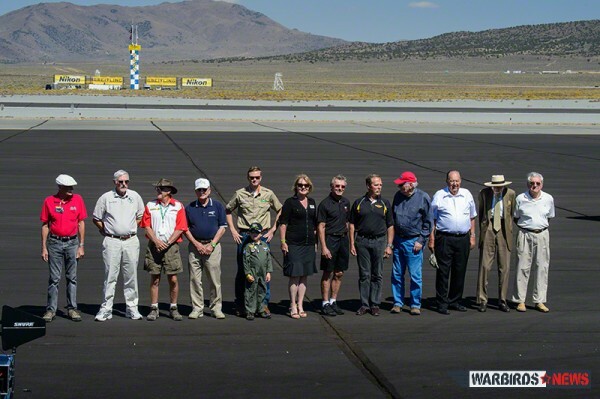 The welcoming ceremony is very indicative of the Reno Air Races. Yeah, we come to see the aircraft but it’s the folks who fly them and keep them flying that make Reno so special. Bud Anderson, Steve Hinton and Bob Hoover are just some of the celebrated fliers who were honored on Sunday. Then you have the fans who make it all possible. 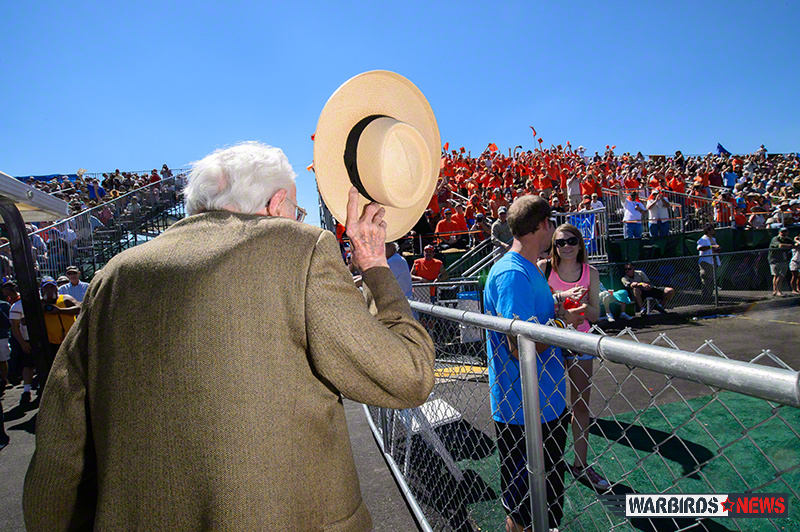 There is a famous group, the Section 3 fans, who all wear orange shirts that truly get the place rockin’. They love Bob and he loves them so after the welcoming ceremony, Bob went over to the infamous Section 3 who POURED out of the stands to greet their hero. It was truly a moving sight to see how they really respect and love Bob. Dennis Buehn in his T6 #43 Midnight Miss III, winner of the T-6 Gold Race. Being a fan, I have my favorites, like all fans, so I need to take a moment to congratulate him. Dennis Buehn in his T6 #43 Midnight Miss III won the Gold Race for the class. Dennis, a great flier and true lover of the T6, has been in the winners circle before, but it had been a year so the team was really working hard to make it happen again. He delighted the fans after landing with a 360 “burn out” in front of the grandstand. Congrats Dennis. P-51D Mustang Miss America, winner of the Unlimited Silver race. The Unlimited Silvers was a very exciting race, very exciting. There is prize money involved in racing with last position in the Gold race paying more than first place in Silver. So delivering a solid performance could move you up and that’s exactly what happened. Starting with from last position, DQed from the previous day’s race, Miss America took first in the Silver putting her up into the Gold Race along with Sawbones who moved up the day before. This set the stage for what everyone had been looking for, the Unlimited Gold Race. The Gold Race starts with a Reno Tradition, the Duck Walk. All the Unlimited Racers for the Gold heat, the pilots, owners, crews and their families all parade from the pits to the front of the Grandstand with great fanfare. The people are all dressed to the nines as they wave to the crowd and the planes are tugged to their parking spaces to create the historic line-up of warbird racers. Then the plane and pilots are introduced to the public, with a recounting of their stats and accomplishments, and quite a bit of color commentary, that gets the fans on their feet cheering. It’s really is what air racing is all about. But then, before you know it, it’s time to get down to business. The Gold Race included featured nine aircraft, P-51Ds, Yak, Bearcat and Hawker Sea Furys. Voodoo, Czech Mate, Rare Bear, Precious Metal, Dreadnaught, Sawbones, Strega, Argonaut and Miss America warmed up on the ramp. All eyes were on Voodoo piloted by Steve Hinton and Strega piloted by Matt Jackson. With all the pomp and ceremony over, the pilots took to their aircraft and taxied out. 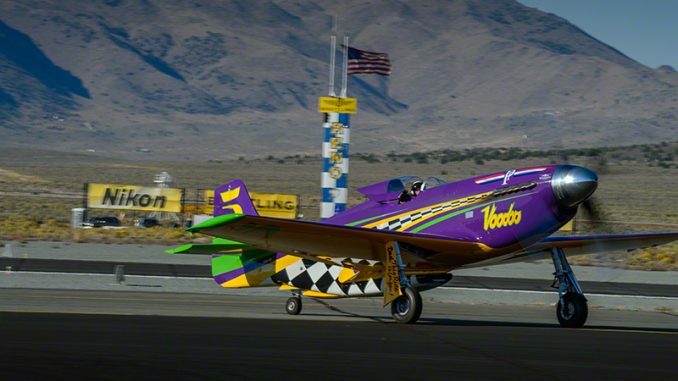 With Steve Hinton (Father of the Voodoo Pilot) in the pace T33 taking off, the unofficial race began as all the racers took off and formed up for the start. And then they’re off! Voodoo jumped onto the course and the lead and never looked back. Strega was the one everyone was watching, could Matt Jackson catch up or pass? Hinton turned in one lap speed of 500.19 making it impossible to catch him. Jackson did a skillful job passing the pack getting himself into the second position but Hinton is simply too good. Jackson couldn’t make up the 8 second lead Hinton enjoyed. So the great week of racing ended with Steve Hinton in Voodoo taking first, Matt Jackson in Strega taking second and Sherman Smoot in Czech Mate taking third. Wow….!!! Luminaries of Reno’s past, present.. and future? 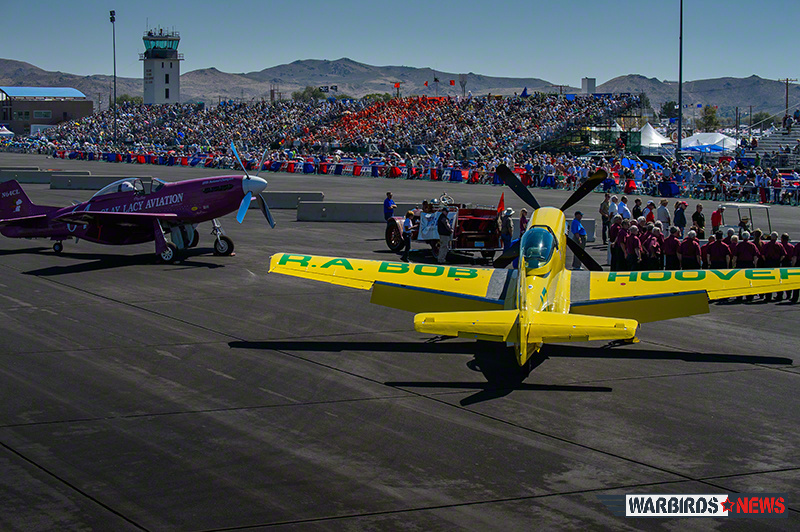 If you’ve enjoyed the amazing photographs of the Reno Air Races, taken by Moose Peterson and you’d like to see more, be sure to check out www.WarbirdImages.com, Moose’s warbird site. He also runs an interesting photography website, and has authored an E-Book, Taking Flight – Your Start into Aviation Photography in which he imparts his expertise in aviation photography, illustrating the most effective techniques for improving your warbird photography efforts, whether you’re a beginner or a seasoned pro. Being an “E-Book,” it contains tutorials, slideshows, sliders, links and videos. Full results for all five days’ races are available HERE. 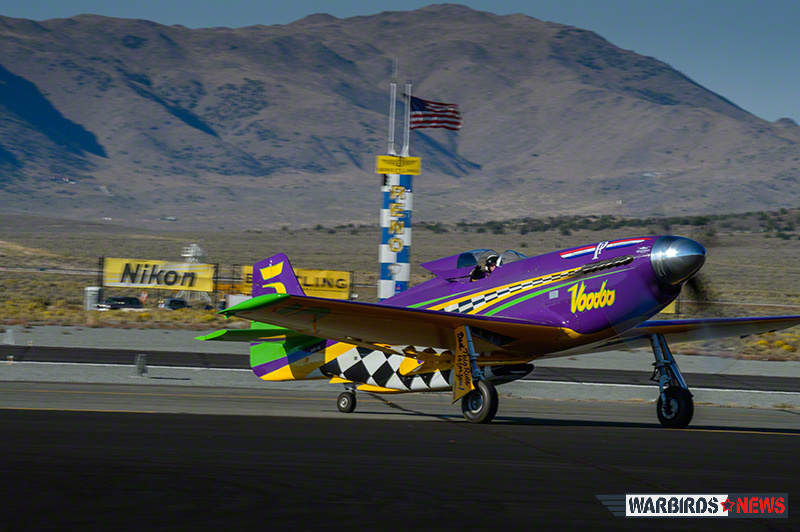 Warbirds News’ Coverage of Day One of the Reno Air Races. 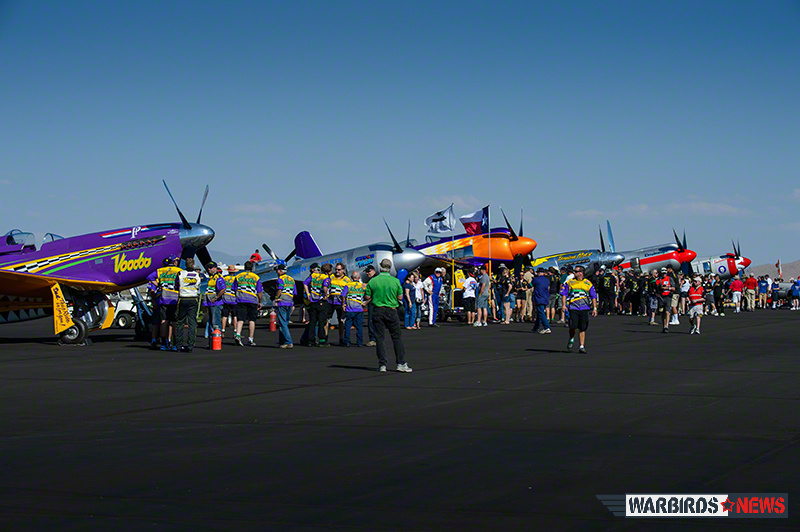 Warbirds News’ Coverage of Day Two of the Reno Air Races. 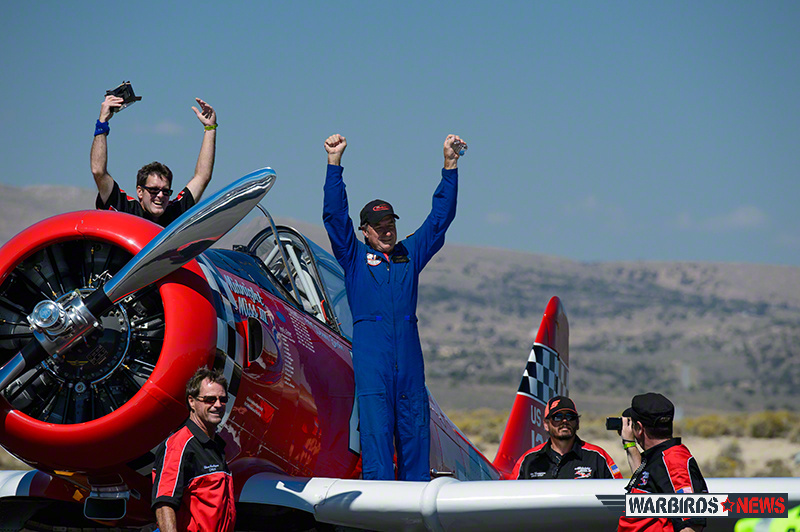 Warbirds News’ Coverage of Day Three of the Reno Air Races. Warbirds News’ Coverage of Day Four of the Reno Air Races. Couldn’t make it this year so I’m glad for your account. Thank you, and hope to meet you next year. I am a WW2 artiste and a Vet. Vet. Glad it finally happened for Voodoo. It has always looked like a winner. I saw Steve Jr. win last year.